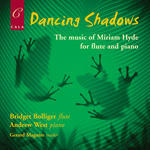 Sea shell fantasy : for flute and piano / by Miriam Hyde. Difficulty: Medium — Flute grade 5 , piano grade 6. 1 Feb 2013: at St Stephen's lunchtime concert (St Stephen's Uniting Church (Sydney)). Featuring Christine Draeger, John Martin.